As a savvy shopper, I believe that paying more for certain items is a better buy. It's no secret that some higher-priced items last longer than cheaper versions, ultimately reducing how much we spend in the long run. But this isn't always the case. As a matter of fact, there are plenty of cheaper alternatives that are just as good (or better) than their luxury counterparts. Here are several of my favorites. My obsession with Keurig started a few years ago, and I added this item to my list of things to buy that would make coffee-making easier and less wasteful for my overnight guests since my husband and I aren't coffee drinkers. As far as hot beverages go, it doesn't get any better than a single serve coffee maker that brews a variety of coffees, plus tea, cider, and hot chocolate. But if you don't want to fork over $99 to $279 for a Keurig (depending on the size and model), a Mr. Coffee Single Serve maker is a low-cost alternative. These single-serve makers start at $59 and do everything a Keurig does for less. I've heard arguments that Mr. Coffee machines are even easier to use than the luxury single serve marker, plus easier to clean and available in a variety of stylish designs to match your kitchen decor. Planning a trip to New York City or San Francisco and thinking about staying in a hotel? You can sleep in the lap of luxury for a few days, but there's a price to luxury. If you're looking to stretch your vacation dollars, using Airbnb to book accommodations provides a cheaper, unique vacation experience. Not only can you meet your host and stay in an actual neighborhood, you get more bang for your buck, which generally includes use of a full kitchen, laundry room, free Internet, and potentially much more. They say diamonds are a girl's best friend — but if your love can't afford to splurge on a huge engagement ring, or if you're simply looking to add to your jewelry collection, moissanite is just as beautiful as a diamond minus the price tag. Diamonds are the hardest mineral known with a score of 10, yet moissanite stones aren't too far behind with a score of 9.25. Moissanite is more brilliant than diamond, resulting in a remarkable sparkle. And since the stone doesn't attract as much dirt as a diamond, it requires less cleaning and maintains its shine longer. If these features don't persuade you to take a chance with this stone, you might sing a different tune after learning that a moissanite sells for a fraction of the cost of a diamond. A 1.5 carat GIA-Certified Diamond can set you back $10,000, yet you can buy the same size moissanite for about $449. Vitamix is a popular and favored appliance in the health world, with the ability to turn fruits, vegetables, and anything else into delicious smoothies for energy, weight loss, or overall better health. But with a price tag around $500, it's a costly investment. Fortunately, this isn't the only option for drinking your fruits and veggies. The Ninja Blender does the same thing, yet has a price tag between $89 and $199. Smaller versions of the Ninja are compact and easily fit in cupboards, which is perfect if you live in an apartment or deal with limited storage space. Also, many models of the Ninja feature a pitcher with a single serve attachment, plus suction-cup feet that keep the blender in place while operating. Seriously, it's the best blender I've ever owned. It's the epitome of elegance and luxury, but if you're working with a tight redesign budget, skipping marble countertops and going with a cheaper concrete alternative can save money without sacrificing your vision. I personally love the look of marble in a kitchen, but after pricing this material for my kitchen remodel and learning that prices range from $125 to $250 per square foot, I know firsthand that there are better ways to spend your budget. Concrete countertops are just as stylish and cost as little as $50 to $65+ per square foot. Not only is this material more affordable, it offers matchless strength and durability, it's easy to clean, and you can choose from a variety of colors and designs to give your kitchen or bathroom a custom look. Tempur-Pedic has a generous selection of memory foam mattresses that conform to your body and promise the best night's sleep. But seriously, who really wants to pay $3,000 or $4,000 for a mattress? Night Therapy might not be a luxury brand, but this entry-level memory foam mattress has a comfort rating of 82%, thus it's an excellent contender if you're looking for a mattress to provide support and reduce back pain. And with a price tag of $400 for a queen-sized mattress, you can get nine or ten Night Therapy mattresses for the price of one Tempur-pedic. As much as I love a brand new car, there's no denying that used cars are often a better deal. Not only because "a new car loses 11% of its value the moment you leave the lot," reports Edmunds.com — but because you get more for your money with a used car. If you have your heart set on a fancy car, used is definitely the way to get behind a fancier set of wheels without going broke. With improved technology, buying a used car doesn't necessarily mean that you're inheriting another person's car issues, either. Some people enjoy driving a new car every couple of years, thus used fancy cars are readily available; and since they're shelling out big bucks for luxury, they're more likely to take care of these vehicles. Also, styles in the luxury car market rarely undergo drastic changes from one year to the next, which means a two-year-old Acura on the dealer's lot could easily be mistaken for a newer model at first glance. Luxury features such as GPS, surround sound stereo, dual temperature control, leather seats, and wood trim are standard in fancy cars. Buy used and you can enjoy these features while paying $5,000, $8,000, or $10,000 less, depending on the year of the car. Some people work hard and save a long time to purchase their dream house — which is usually a mini mansion with amazing views of an equally impressive back yard. To each his own. 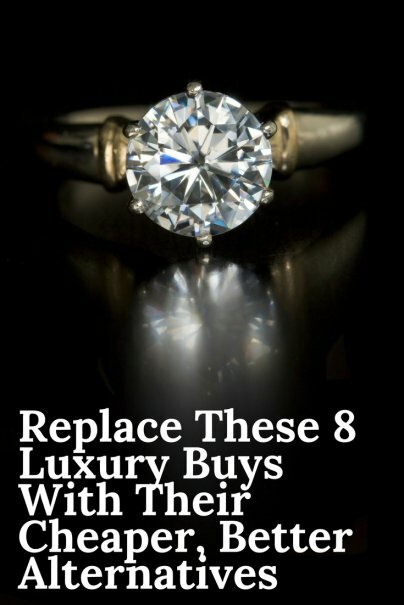 Can you think of a luxury item whose cheaper alternative is better? Let me know in the comments below. I don't know if it's just my current car buying experience but I was looking for a low mileage (less than 50k), late model car and found that the used cars I was looking at weren't that much less than a new car. I don't know if that's a regional thing (I'm in the Midwest) or because the model year end clearance pricing is kicking in. I'd be interested in hearing if others have run into this. I have heard that used cars are in higher demand lately and lower supply. For those looking to buy, or especially build, a house, I highly recommend reading "The Not So Big House" By Sarah Susanka (see http://goo.gl/Cun1NZ). Another alternative to the Tempurpedic is the Casper mattress. Keurig is atrocious... mr. coffee pods somewhat less atrocious... and the coffee isn't even half good. Burr grinding whole beans by the cup is by FAR the best thing you can do for general coffee quality. A hopper-fed grinder makes it easy. After that, just boil some water in the microwave in a pyrex cup, add a splash of cold water to cool it below a boil, then either pour-over or Aeropress. Neither solution is quite as easy, but both ARE easy, and you won't believe how much better your coffee tastes. Seriously, it's going to blow your frikkin mind.